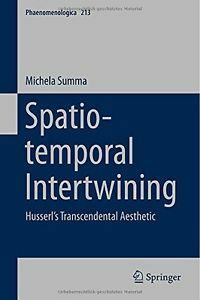 The winner of the 2016 Edwin Ballard Prize is Michela Summa’s Spatio-Temporal Intertwining. Husserl’s Transcendental Aesthetic (Springer, 2014). Spatio-Temporal Intertwining approaches temporality and spatiality as non-self-sufficient dimensions that can be described separately, but are ontologically intertwined in the wholeness of sensuous experience, addressed in terms of Husserl’s transcendental aesthetic (introduced via comparison with Kant), which she interprets in terms of the universal a priori of correlation (rather than prioritizing either the “subjective” or the “objective” side). She develops a description in which both space and time are to be considered in terms of “spreading” (Ausbreitung), not extension, i.e., as a continual synthesis of interwoven moments, not as a sum of discrete, self-sufficient parts. The concrete analyses she uses to exemplify spatio-temporal intertwining focus on themes of individuation, perspectivity (both spatial and temporal), teleology toward optimal perceptual givenness, and especially the lived body, since bodily experience itself turns out to be deeply intertwined with both spatiality and temporality. For example, whenever I am explicitly aware of an object “over there,” there is an accompanying, albeit implicit, awareness of my bodily here and its “normal” kinaesthetic possibilities as well as its localized somaesthetic sensations (Empfindnisse). And the notion of an implicit bodily awareness is further worked out in terms of bodily memory as “implicit” memory keeping the past present through associative/affective structures of its own (in contrast to memory as explicit Vergegenwärtigungen conjuring up past scenes that “hover before me”). The connection of Husserl’s transcendental aesthetic with the notion of implicit bodily memory is an original contribution of this author. (The notion of implicit bodily memory has indeed been explored by others — notably Edward S. Casey and Thomas Fuchs — but without linking this theme to Husserl’s rich analyses in the D mss. and elsewhere.) More specifically, she deals with elements of subjective life that may usually be unthematic or non-actional, but can nevertheless be brought in principle to itself-givenness in the manner appropriate to them. In other words, she avoids the tendency to relegate all such matters to a “pre-reflective” realm assumed either to be “pre-personal” and beyond reflective reach (as in the most common interpretation of the “operative”) or “sub-personal” and accessible only to neurological research. This is especially palpable in her descriptions of bodily self-awareness and genetic acquisition of bodily skills, where, following Husserl, she retrieves these matters from anonymity so that they can be investigated on the basis of the relevant experiential evidence. The Center for Advanced Research in Phenomenology is therefore pleased to be able to recognize these contributions with this year’s Ballard Prize. Visit the page for Summa’s book at Springer.